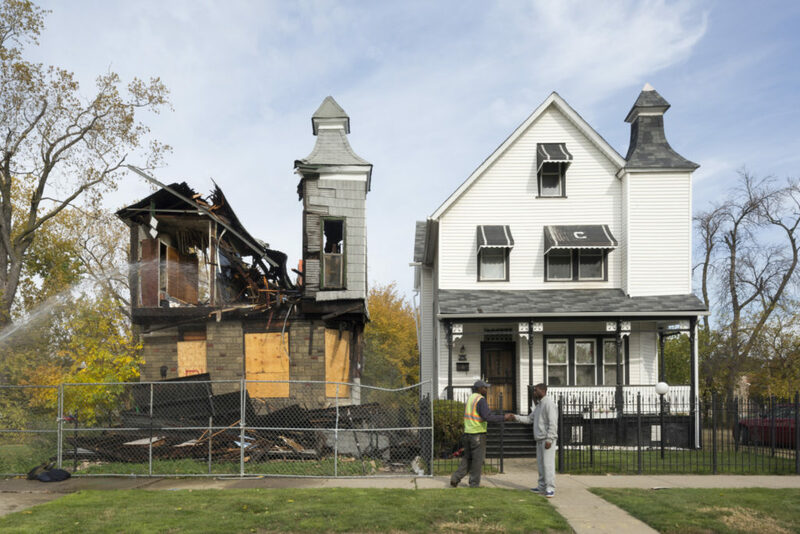 The phrase ‘Fix it Up, Don’t Tear it Down’—also the title of a painting by Chicago artist Nikko Washington—entered my mind as I watched The Area. Just as Washington’s visual protest paid homage to the now-demolished and gentrified Cabrini-Green homes, reflecting the emotion of its residents, the conversation around erasure of neighborhoods and displacement of families in Chicago is very much at the core of The Area, a complicated documentary that unfolds a story of economic revitalization, commercial interest, and community rights. Directed by David Schalliol, a sociologist and photographer whose work the Weekly has published, the film is a self-described “five-year odyssey…[of] 400 African-American Englewood families who are being displaced by a multi-billion-dollar freight company.” The teardowns are inevitable, but the residents don’t give up easily and continue to fight for environmental safety, job opportunities, and respect while their side of the tracks is still considered home. A few minutes into the film, a young girl asks, “Why are they going to knock that house down?”, as she points to the home she was born in—one her family has owned for more than twenty years. Her voice is innocent and filled with curiosity. The moment leaves an unsettling feeling in the pit of your stomach, made even more unsettling by the juxtaposition of the scene’s final shot: two houses, footsteps apart—one in healthy standing, and the other vacant, boarded up, and in the beginning stages of crumbling down. From the first scene, audiences are met with basketballs making their way down a makeshift basket, a game of chess being played outside, youth riding bikes, folks on the grill, and a family enjoying a hot day in a backyard swimming pool. Faces wear smiles, laughter fills the clear sky, and for the time being, everything seems to be alright. But this part of Englewood, in the immediate area of 57th Street and Normal Boulevard, is actually also facing the fact that what they call “home” will soon be dust particles and memories of what once was as the houses are torn down to create parking space for a $1.1 million project proposed by Norfolk Southern Railway and given the green light by political leaders, including 20th Ward Alderman Willie Cochran, and the city of Chicago. Instead of setting up shop in a more affluent part of the city, the railroad company decided to expand their 47th Street terminal and claim ten square blocks of Englewood, a neighborhood that has faced population declines and high rates of home foreclosures. Given the dark framing of the neighborhood by most media outlets, it would be irresponsible for The Area to shy away from the raw truths of poverty and crime that surround Englewood narratives. So it doesn’t. However, exploitation has no role in the intimate storytelling that unfolds. Instead, Schalliol is intentional in using his camera to make us feel the community. His inquisitive lens goes beyond the headlines to pose questions and investigate the root causes of blight without explicitly giving answers. At its core, the film demonstrates how systemic racial and political inequalities play an active role in the devastation of communities. With assistance from the Chicago City Council, aldermen, and other business interests, Norfolk Southern acquired eighty acres of Englewood, dipping right into the heart of the area in its quest for expansion. The company’s process included going door-to-door and asking homeowners to sell their homes for the fair market value. Whether they willingly sold or not—a decision also explored in the film—it was already determined they wouldn’t be living there for much longer. We hear from community members about their feelings of disrespect, the sense that their concerns are being dismissed. We’re visually invited into a closed City Council meeting that paints a false picture of resident satisfaction, suggesting that the housing sales and transitions were smooth. We witness the relationship Cochran, who is currently reportedly negotiating a guilty plea to bribery charges with federal prosecutors, has with the community. “It’s a relationship predicated on a lack of responsiveness. It’s of saying one thing while doing the other,” Schalliol said. As a viewer, you’re invested in and connected to those moments of frustration. The complaints of environmental hazards such as gas leaks, flying dust, broken tree limbs, vandalized and abandoned houses—along with the lack of support to fix any of these problems—aggravates every nerve. The healing thread, however, is the community we come to learn about in the process. By following Deborah Payne, an “Englewoodian,” homeowner, community activist, and co-producer of the documentary, we see the investment that people have in their homes, neighbors, and community, and the pain it causes them to have that wrenched away by big business and the political elite. We also meet the Row-Row Boys, a crew of teens reluctant to start a new life across gang lines. Both Payne and the Row-Row Boys give us access to a side of the neighborhood rarely explored by traditional media accounts: its longtime residents. And it’s Payne, who lived in her Englewood home since 1980, that continues the fight for respect. Payne’s devotion to sustaining a quality of life among her neighbors until the last house is knocked down carries an energy throughout the film that illuminates the meaning of ‘“home”—it’s an admirable show of resilience, evidence of the power that comes with cultivating a neighborhood full of personality, courage, and heart. Today, the area is deserted and Payne is a Bronzeville resident. Still, the conversation surrounding the issue is ever-evolving, as the film continues to screen domestically and globally, challenging mindsets along the way. For Payne, her footprints are forever embedded in Englewood. LaToya Cross is a contributor to the Weekly. She is a freelancer with a love for arts, culture, poetry, and entertainment. She last contributed a review of a new short documentary about Gwendolyn Brooks in June.